This is a BIO I was asked to do a while ago for a Trusted Breeder group that I am apart of. Enjoy! Hi everyone! I was asked by Denise to put a little Bio together for all of you, so here it goes! My name is Stefanie Peacock, I am 32 and have lived in Utah all my life and love it here. I first started my true love of animals when I was really young. My mom bred Golden Retrievers and Himalayans. It was so interesting to me to see my mom help the mother dogs and cats birth the babies. My mother is a huge animal lover and I remember being pretty young and we would be walking past pet stores and I would always ask to go in and look around and my mom always took the time to let me browse through the pet store for a few minutes. I have always loved cats and actually started out breeding Himalayans myself back in 2002. In 2004 my son Christian was born and he is super allergic to cats and even through it broke my heart I gave my female and male away to a fellow breeder in Arizona. So, in 2006 I adopted Molly and my son did fine with her, I really missed breeding so I thought we would get another pup if he did fine with her and he did! So 6 months later we adopted Charlie and in 2007 had our first litter! We have had several litters over the year and I just love what I do so much. My best friends Lisa laughs at me every time we have a litter of pups, because I cry when they are born. It is just a miracle and special to me! I love these little darlings so much! So, I have been breeding these little ones since 2006 and I love it. I started a website www.peacockshihtzupuppies.com and most of my adoptive families now are referrals. I had a lady come from Canada the last litter to adopt a puppy. Several from California and Arizona, Idaho and Colorado. This litter coming up, a lady put down a deposit from New Jersey. Kind of funny they are coming that far, but it makes me happy and kind of warms my heart a little, because I know I am doing something right if these families are willing to travel so far just for a Peacock puppy!!! J I have a really good reputation out there in the community and it makes me happy. I am so happy to place these dogs in good homes and I love watching the adoptive families eyes light up when they come to adopt their pup. It brings me joy and I just love it! I live in Sandy, Utah and have lived in the same house now for almost 10 years. We love our neighbors and our church family. It is a really good area. I married my sweetheart in 1999. We have three beautiful kids together, McKell 12, Jocelynn 10, Christian 8. And of course 5 wonderful dogs! Molly is our oldest and most wise dog! She has beautiful babies and I would say her puppies are the most coveted. Bailey is pregnant right now and she is due at the end of next month. I have sold 4 of her puppies right now. 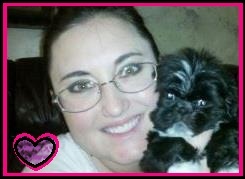 (All referrals and one repeat customer) I am proud of the little Shih Tzu club I have started over here. I have a lot of very happy customers and most of them (about 90%) send me a review and are then posted on my website. I love hearing back from my adoptive families over the years. I love seeing their puppies grow. So much so, I started a website on facebook for people to join that have adopted previous pups and are looking to adopt pups. The website on facebook is: http://www.facebook.com/peacock.shihtzupuppies.1?fref=ts I really love this site and if any of you want to join in for the fun please do so! Shoot me a friend request and I will add you right away. I also will post helpful tips and sometimes videos of things to do and look for while raising your Shih Tzu’s. If you ever have any questions you can call me or email me 801-634-7233 dr.kylepeacock@yahoo.com / Stefanie_peacock@yahoo.com I do not know everything there is to know, but I have been doing this for over 6 years now and I have learned a lot. Every litter I learn a little more. I have also become great friends with breeders around Utah. Julie is one of the best of friends. She is someone I call when I am stressed or worried because she has been through this all and knows exactly what to say. She actually helped my Bailey last year this time deliver her puppies because we had a scheduled trip to Disneyland for Halloween. She is a true friend and I am glad I found her. Thanks for letting me a part of your group and for letting me share a little something about myself.